A record number of Minnesota State Fair attendees took transit to and from the fairgrounds on Saturday, Sept. 1, when the fair also saw its busiest day ever. More than 83,500 rides were provided on State Fair Express Buses and regular routes that serve the fairgrounds on Sept. 1. That’s the highest daily ridership since 2008, when Metro Transit also operated free fair shuttles. The Minnesota State Fair set a single-day attendance record on Sept. 1, when more than 270,400 visitors flocked to the fairgrounds. The fair also set a new total attendance record, with more than 2 million visitors. In all, Metro Transit provided nearly 600,000 rides to and from the fairgrounds over the course of the fair, representing 14 percent of visitors. The busiest Express Bus Park & Ride was in Bloomington, near the Mall of America. More than 94,000 rides were taken to and from that location. Ridership at the Maplewood Mall Transit Center increased 65 percent compared to 2017, the largest year-over-year increase among the 19 Park & Ride locations. 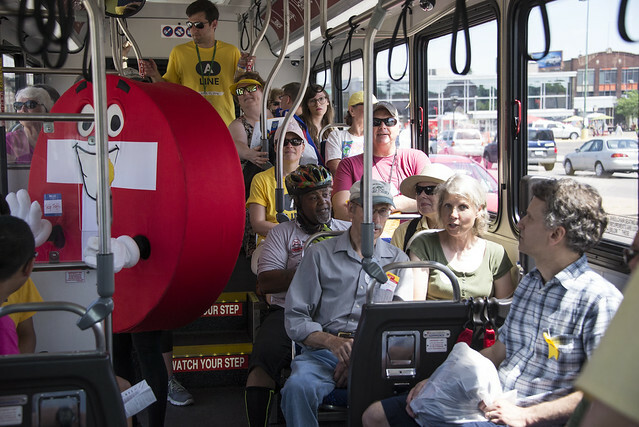 A record number of fairgoers rode to and from the Minnesota State Fair with Metro Transit and the METRO Green Line had its busiest day ever when the fair and several other events landed on the same day last week. Metro Transit provided just over 654,000 express and regular route bus rides to the State Fair, topping last year’s record State Fair ridership by just over 21,500 rides. The ridership total accounts for just over 16 percent of State Fair attendance, which also reached an all-time high this year. State Fair Express Bus service was offered from 13 Park & Rides throughout the Twin Cities. This was the 25th year Metro Transit provided express bus service to the State Fair. The State Fair ridership total also includes rides provided on several routes that serve the fairgrounds, including the new A Line on Snelling Avenue. Fairgoers and fans also helped set a single-day ridership record for the Green Line on Thursday, Aug. 31. There were 68,071 Green Line rides taken that day, surpassing a previous-high of 66,018 rides, set on Oct. 3, 2016. Systemwide, 358,617 rides were taken on Thursday, Aug. 31, when weekday commuters were joined by fairgoers and fans traveling to Twins, Vikings, Gophers and Saints home games. The total is slightly below the single-day record of 369,626 rides set on Sept. 1, 2016, and is 37 percent higher than the year-to-date average weekday ridership. The Aug. 31 total also includes 241,000 bus rides, 44,000 Blue Line rides and 5,500 Northstar rides. See how it all went down in this video. Thanks for riding! Wherever you’re coming from, Metro Transit is the easiest way to get to and from the Minnesota State Fair. Even if you’re an experienced customer, though, there are a few things you should know before heading out for food, fun and farm animals this year. Customers who use Metro Transit’s new mobile app to purchase State Fair express bus tickets will receive a discount through the end of the State Fair. The best discount is four tickets for $15 – a $5 savings that can be put toward a bucket of Sweet Martha’s or other fair food. The free app can be downloaded through iTunes or Google Play. Round-trip fares – still $5 – can also be purchased for a discount in advance online through opening day or in cash at the time of boarding. As always, parking at Metro Transit’s Park & Ride sites is free! The end of summer usually brings relief from road construction. That’s not quite the case this year. Construction on I-94 will affect all traffic coming through downtown Minneapolis from the west metro. To avoid the mess, express buses traveling to and from the I-394 & County Road 73 Park & Ride will travel through the north metro using roadways with bus-only shoulder lanes. Buses traveling to and from the Dunwoody Park & Ride may also be re-routed to avoid congestion. Due to construction in the East Metro, buses serving the Newport and Cottage Grove Park & Rides may also be diverted. Customers who know they want to arrive at a certain time should plan ahead and consider giving themselves extra time. Another date when roads might be a little busier than usual: Thursday, Aug. 31, when the Twins, Vikings, Gophers and Saints all play at home. Due to construction, express buses will no longer be serving the National Sports Center in Blaine. Instead, customers can catch express buses from the 95th Avenue Park & Ride just a few miles east off Interstate 35W. The Park & Ride will remain open to commuters throughout the fair, but with 1,500 available parking spaces there will be room for everyone. One bonus of the new site: covered waiting areas that provide shade and shelter in the event of poor weather. Metro Transit employees will be out in legion and happy to answer any questions you may have. Before leaving home, though, you may want to review schedule and location information and check Metro Transit’s Twitter feed for service updates (some Park & Rides do reach capacity). You can also find Metro Transit at the Eco Experience and the Grandstand – come say hello! Metro Transit provided 575,348 rides to and from the 2015 Minnesota State Fair — an 8 percent increase over last year and the highest express and regular route ridership ever. The ride total accounted for 16 percent of State Fair attendance, which reached 1.8 million. The percentage of fairgoers who traveled to the State Fair on Metro Transit was the highest since 2008, when Metro Transit also operated free shuttles to the fairgrounds. The highest single-day ridership to this year's State Fair was on Saturday, Aug. 29, when nearly 70,600 rides were provided. Almost 90 percent of State Fair ridership was from the 13 free Park & Ride locations where Metro Transit provided State Fair Express Bus Service. Three regular routes — the 3, 61 and 84 — and Route 960 from downtown Minneapolis also served people traveling to the State Fair. Metro Transit staff and operators collectively dedicated nearly 15,000 hours to State Fair service during its 12-day run. As always, all operating costs are covered by fares. The Minnesota Valley Transit Authority reported an 18 percent increase in State Fair ridership, and SouthWest Transit said it, too, set a new record.